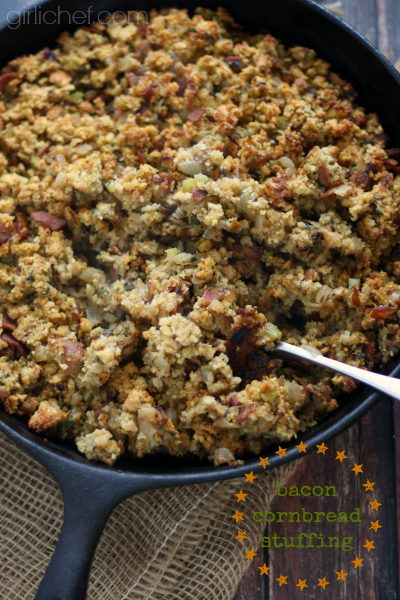 Over the past few years, I've tried quite a few different stuffing recipes. Another thing about the past few years that I've noticed? A lot of stuffing has gone uneaten. By anyone other than me. So, as much as I love trying out different flavor combos and add-ins, do you know what I love even more? When every single person at the table gobbles (pun intended) up their helping of stuffing. Maybe they even coo over it a little. That is exactly what happened when this cornbread stuffing made its appearance on our Thanksgiving table this year. I decided that instead of combing through my many years of magazine pages with frayed edges and recipes jotted down on notebook paper and bookmarks on my computer, I'd just ask for suggestions. The number one request was for cornbread stuffing. Without any "funny stuff" in it. Or stuff that tastes weird. I can do that. I was torn between sausage and bacon, but in the end, bacon won. Doesn't it always? This is one that I'm guessing will be requested every year. It's simple. But the smoky, salty bacon...the sweet, caramelized onions...and the fresh green herbs accent the almost nutty flavor of the cornbread so perfectly that I wouldn't have it any other way. If using fresh cornbread, crumble it and spread it out on a baking sheet to dry overnight (or toast it in the oven briefly to just dry it out). Slice bacon into 1/4" strips, the short way. Place it all in a small to medium-sized saute pan over medium heat and cook until crisp. 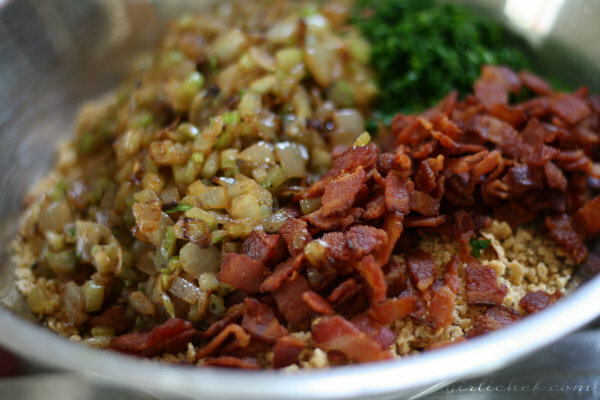 Lift out the bacon with a slotted spoon and place it on a paper towel-lined plate to drain. If there is more than 2 tablespoons of bacon grease in the pan, drain off any extra. Set over low heat and add onions, cooking slowly, and stirring occasionally, until they are golden, ~7 minutes. Add celery and cook for another 3-4 minutes. 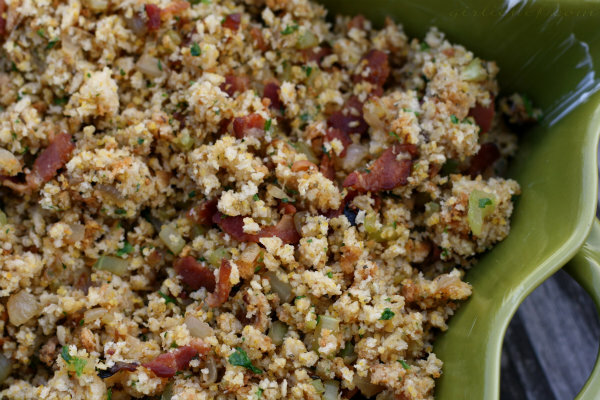 Combine cornbread crumbles, onion mixture, bacon, and the herbs in a large bowl and toss to combine. Season to taste with salt and pepper. Moisten with the broth, a little bit at a time until the mixture is thoroughly moistened, but not soggy. At this point, you could either stuff it into the cavity of a turkey and let it do its thing...or...place into a buttered baking dish (9" x 13" or a 10" cast-iron skillet) and cover with foil. Bake in an oven that has been preheated to 400° F for 30 minutes. Remove foil and bake until the top is crisp and golden, another 20-30 minutes. If you're going to be "holding" your stuffing for any reason, keep some warm turkey stock on the back of the stove and moisten the stuffing a bit, as needed. Oh yeah, and those Cranberry-Barbecue Turkey stuffed Sweet Potatoes that I made yesterday? This is the perfect topper for those babies! 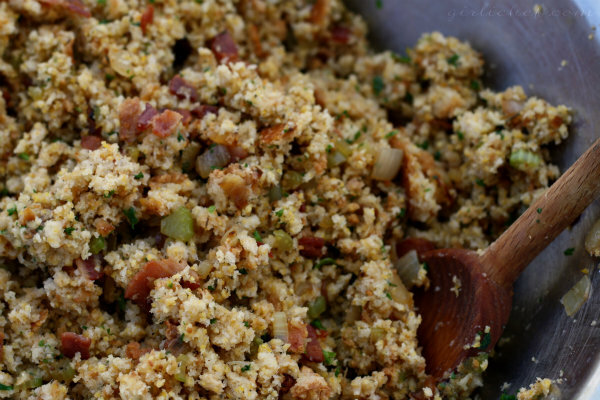 What kind of stuffing does your family enjoy the most?